This is a bold and timely analysis of the conflict in Northern Ireland, offering a comprehensive, up-to-date and constructively critical evaluation of the massive outpouring of literature on the subject. John McGarry and Brendan O'Leary examine the most common explanations of the conflict - nationalist, unionist, Marxist, religious, cultural and economic - highlighting their shortcomings and placing Northern Ireland within a comparative context. Synthesizing their conclusions, the authors advance a realistic but imaginative prognosis for conflict-resolution in this most troubled region. John McGarry is Associate Professor in the Department of History and Politics, at King's College, University of Western Ontario. Brendan O'Leary is Reader in Political Science and Public Administration in the Department of Government at the London School of Economics and Political Science, University of London. Their previous works include The Future of Northern Ireland (1990); The Politics of Antagonism: Understanding Northern Ireland,(1993) and, with Tom Lyne, Jim Marshall and Bob Rowthorn, Northern Ireland: Sharing Authority. Part II: Internal Explanations: . 5. Warring Gods: Theological Tales. 6. Fiery Values: Cultural Interpretations. 7. Mammon and Utility: Liberal Economic Reasonings. Part III: Synthesis and Futures:. 8. No Place Apart: Comparative Political Analysis. 9. Pain-killers, Panaceas and Solvents. Appendix A: The Joint Declaration for Peace (December 1993). Appendix B: Analysis of the Text of the Joint Peace Declaration. 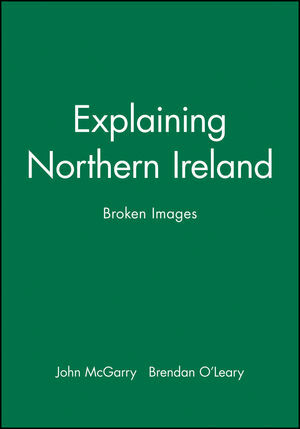 * The single most authoritative and up-to-date analysis of the Northern Ireland conflict and the various attempts to explain it. * Authors are two of the most eminent and respected commentators in this field. * Provides in-depth assessment of Joint Declaration of Peace of December 1993.